This page describes some best practice for clothing and outfit creation, using the Vlad outfit which you can download original source files for here. We recommend following current game character modelling practices; specifically using PBR texturing tools and low poly models with a high detail normal map. This brilliant set of four short tutorials are a fabulous start to learning how to create detailed clothing. The Vlad outfit was created with a set of high detail models (totalling 1 million polygons) to create normal and tangent maps and a set of low detail models (totalling 12,000 polygons) for upload to the Space platform). Watch the tutorial for creating detailed clothing here. Tessellation shaders allow you to create multi-million polycount details across your model with almost no performance impact. They are fantastic at creating ultra-smooth surfaces that you can zoom in to as close as you like. 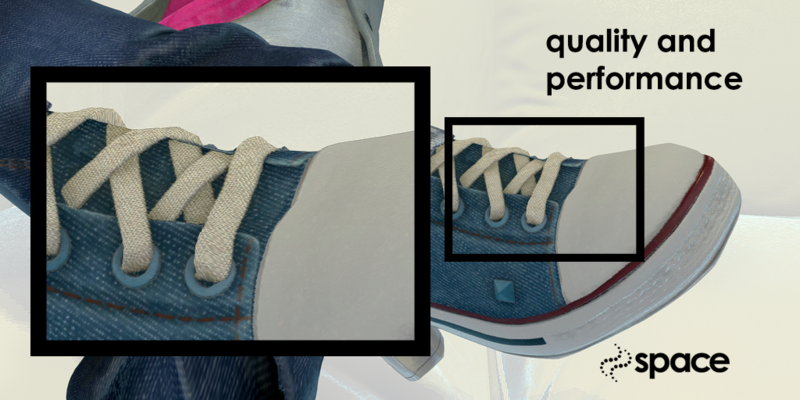 Using tessellation shaders means you no longer need to sacrifice inworld performance to achieve a high quality product. Tessellation shaders create dynamic multi-million polycount level of detail, controlled by camera distance. They use Phong Tessellation to ensure that hard edges are rounded by tessellation processes. The phong strength setting has values of 0.1-1.0; 0.1 being the minimal smoothing, and 1.0 being the maximum smoothing. We recommend setting the phong strength to between 0.1 and 0.3 for the best results; higher values may introduce artefacts (especially when animating the model). Please make sure your renderer is 'skinned' when adjusting these settings otherwise the values you set will look different in world. Please paint red all vertices that run along UV seams. Phong Tessellation can fail on UV seams where the vertices are not connected. This will create gaps in the mesh around UV seams. Our tessellation shader has support for excluded zones - to exclude a vertice from tessellation, paint the vertex colour in your 3D modelling tool pure red (255,0,0). This will tell the shader to avoid separating the mesh on this area. Best Practice – where does it make sense to to use tessellation and where to use geometry? Tessellation height maps can introduce complex patterns that would otherwise require extreme polygon counts; such as fabric ruffles, distressed or wrinkled items. They work best with organic patterns that do not contain hard edges - unless they are slightly rounded. As a guiding principal, set the Tessellation Edge to between 5-15. Higher is exponentially better performance (so 15 is 9x better performing than 5). Unless you are using a heightmap there should be no reason to go below 15 - as that will appear generally perfectly smooth. This means no triangle with an edge shorter than 15 pixels will be created. Setting the edge length shorter than this offers marginal visual benefits but may start to impact on performance. 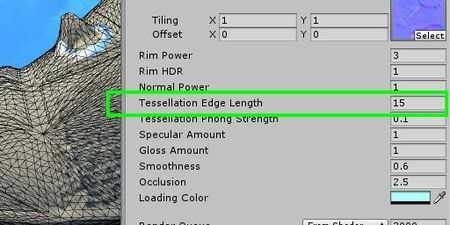 Avoid setting Tessellation Edge to 1! Hard edged non-organic shapes should have a basic geometry rather than in tessellation - as bitmapping of the heightmaps can introduce undesired noise on the model. Basic tessellation with smoothing is excellent for rounding off ultra smooth surfaces (think shoes and other elements which want ultra smoothed corners). Space supplies a custom shader to handle the tessellation on clothing items which is available free in the Space editor pack. Search for Unified Clothing & Skin (Metal and Tessellate) and add this shader to you clothing material. Use skin weight transfer if you have non-skin tight clothing (dresses, baggy items). Then reweight by hand as appropriate. 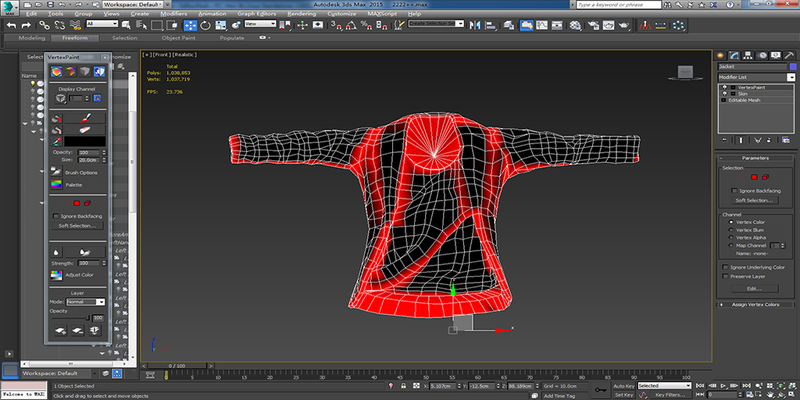 You can use our automated skinning system built into the clothing component if your clothing item is skin tight. PBR allows you to accurately simulate a huge range of materials. It carries through energy conservation, so avatars will look better across a wide range of lighting environments, maintaining a realistic look throughout. Our PBR maps follow a Metalness/Smoothness workflow (based on the Unity 5 Standard Shader) - however as a general note, Specular/Smoothness workflows work just fine too. These are the tools we recommend for creating PBR textures. Marmoset is used to preview the PBR texture in Photoshop as you can't preview in Photoshop, but you can edit in Photoshop and see the results update instantly on your model in the Unity editor. For adding additional patterns to your clothing, see Creating Clothing Patterns for more details.